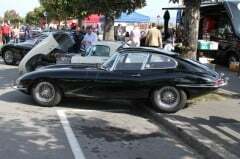 Morges in Switzerland hosts a free but very impressive show day for around 1,500 British classic cars in the parks and on the quays of Lake Geneva. The Swiss Classics British Car Meeting is held annually in October in the castle-town Morges on the shores of Lake Geneva near Lausanne. 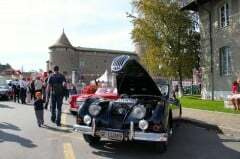 Owners of British classic cars are invited to park their cars for free in the parks and on the quays of Morges for visitors to admire and reminiscent of a bygone era. Cars range from classic Rolls Royces and Daimlers to simpler Vauxhalls and Minis. Car models, which celebrate a special milestone, e.g. 50 years since launch, are specifically invited each year and displayed in an exclusive area. Exhibiting and viewing are free. In 2016, the Swiss Classic British Car Meeting will be held on Saturday October 1, 2016, from 10 am to 5 pm. 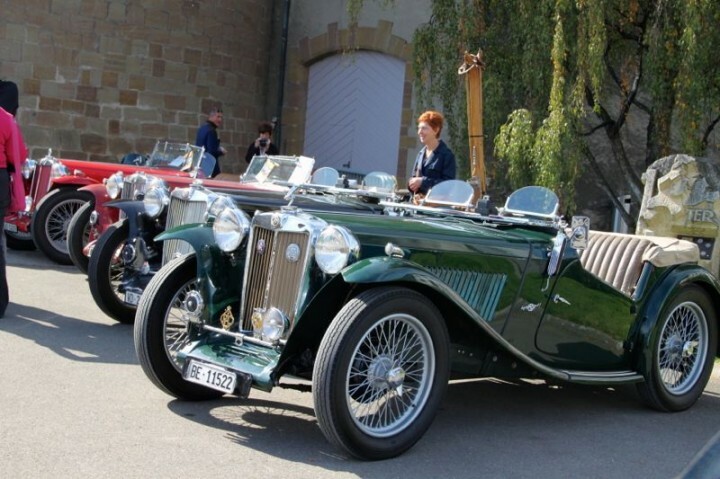 The Swiss Classic British Car Meeting provides a lovely day out for owners of British classic cars, as well as visitors with even just the slightest interest in historic cars. Owners show-off their cars while visitors can admire classic British cars close up. 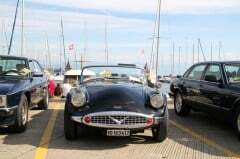 The meeting of British classic car owners in Morges is now well into its second decade and generally keeps growing. Annually, around 1,500 cars are expected. The exact figure cannot be predicted, as there is no need to preregister, with very few rules and requirements. The emphasis of the British classic cars meeting is on fun and relaxation. Rules and regulations are at a minimum. Costs for both owners and visitors are zero. The basic rule is that the show car should be British and older than 20 years. Condition and class are immaterial, although newer cars are unlikely to be shown the door if exotic enough. 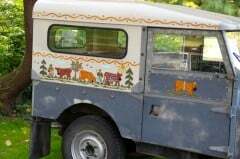 Modern Land Rovers, Range Rovers, Jaguars and Minis are no longer admitted. Other than parking their car and displaying the car information, owners have no other formal responsibilities to attend to. No competitions or formal meetings are actually held. 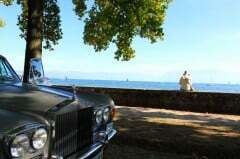 The Swiss Classic British Car Meeting is usually held on the first Saturday of October in Morges. Cars are displayed in the large independence park as well as the quays of Lake Geneva. Admission is free. The car show runs from 10 am to 5 pm. However, participants may arrive and depart at any time without restrictions. Thus some arrive long after others have already left again. A good time for visitors is around noon or early afternoon when the display is at its largest. The variety and quality of cars on display can be quite astonishing. Simple original Minis abound but historic Rolls Royces, Bentleys, and Daimlers are surprisingly well represented too. MGs are very popular. Several DMC De Lorean “Back to the Future” cars as well as other rarities can surprise. Although most cars are from Switzerland, British cars arrive from all over Europe for this event, as is obvious from the large number of foreign number plates. Buying and selling is not actively encouraged but a few cars will display “for sale” signs. The show is also a good opportunity to meet with other enthusiast while specialists industries have exhibitions and can provide useful contacts for spares and restoring. Concession stands sell basic food and drinks on the quays while several good, if pricy, restaurants face the lake. Many more restaurants and cafes are in the pedestrian zone and main shopping street of Morges a block inland. 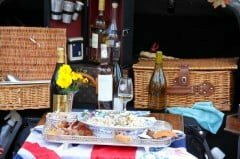 Many car owners wisely bring their own picnic along, as queues can be long at lunchtime. 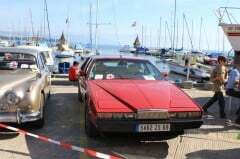 As the British cars are displayed in parks and on the quays, the number of parking spots in Morges is not reduced that dramatically. However, Saturday is also market day in Morges and parking does become difficult. Few would regret using public transportation to Morges on British classic cars day. Trains are available around four times per hour to Geneva (around 30 minutes) and Lausanne (12 minutes), with direct connections available on the Montreux, Neuchatel, Bern, and other parts of Switzerland. The CGN Lake Geneva passenger pleasure boats unfortunately calls only rarely in Morges at this time of the year. The boat from Lausanne arrives around 11:20 am with a return to Lausanne at around 16:45. Boat and train combinations are easy to book, or simply buy two separate tickets – the prices are the same. Morges itself is a lovely town to visit. Its mighty castle houses four museums, while its quays and parks afford great views of Lac Léman and Mt Blanc. Morges is famous for its display of dahlias on its well-maintained lakeside promenades, as well as the beautiful tulip festival each spring. 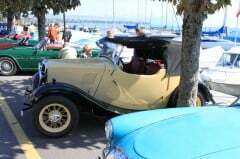 Vintage Swiss-built cars can be seen in the Lake Geneva region in a small section of the Pierre Gianadda Foundation in Martigny. 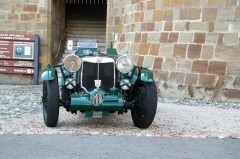 The cellar of Grandson Castle on Lake Neuchatel also has a surprisingly fine collection of cars in its basement.